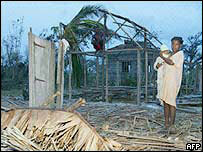 Nearly 145,000 people have been left homeless by a cyclone that tore through Madagascar, killing 44 people. The figures double previous estimates of the havoc wreaked by the category three cyclone and have raised fears of a humanitarian catastrophe. Cyclone Ivan struck the island's east coast last Sunday, and was followed by torrential rains which caused flooding, leaving many communities cut off. Winds gusting at more than 230km/h (140mph) caused widespread damage. With large areas of the huge Indian Ocean island still only accessible by air or water, infectious diseases such as diarrhoea are reported to be on the rise. Malagasy officials say the difficulty in reaching isolated villages has hampered the relief effort after an urgent appeal for international assistance was launched on Friday. With the cyclone season not expected to end until April, the government has warned that further storms could follow. Foreign Affairs Minister Gen Marcel Ranjeva said the situation on the ground was "deplorable" and warned last week that things are likely to get worse. "Whole villages have been wiped out, many roads are completely blocked, buildings have been destroyed and in the capital the water has risen extremely quickly," he said.